Thank you for joining us in celebrating our nation’s K-12 teachers during Teacher Appreciation Week! We’re so happy that you’ve decided to help us spread the word to your employees and/or customers so they can pre-schedule free Thank-You eCards for their favorite teachers. Feel free to use any of these assets for your channels, or to develop your own branded marketing. For custom sizes, contact our marketing department at [email protected]. Happy Teacher Appreciation Week! Thank the teachers in your life. Go to AdoptAClassroom.org/ThankATeacher and pre-schedule your free thank-you eCards with AdoptAClassroom.org. Select your favorite e-card and join us! Most of us can easily name a special teacher who made a difference in ours or our children’s lives. It’s time to say Thanks. Teacher Appreciation Week is May 7-11. 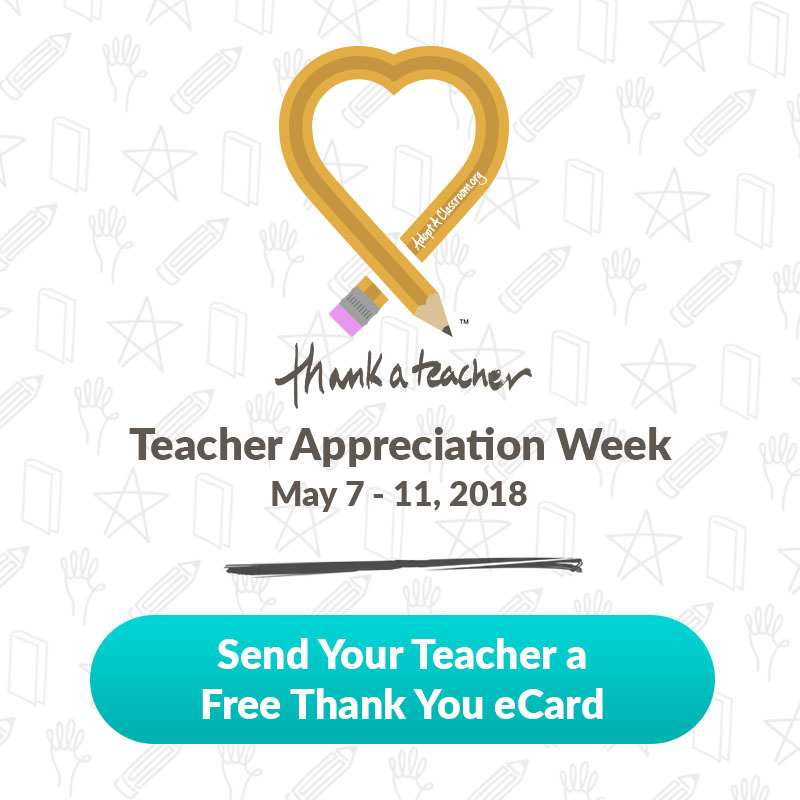 In support of our non-profit partner, AdoptAClassroom.org, and our nation’s K-12 teachers, we’re inviting each of you to thank your favorite teacher with a free video eCard. While the eCard won’t cost you anything, it will mean everything to a teacher. Pre-schedule your free video eCard at AdoptAClassroom.org/ThankATeacher. It’s quick and easy. 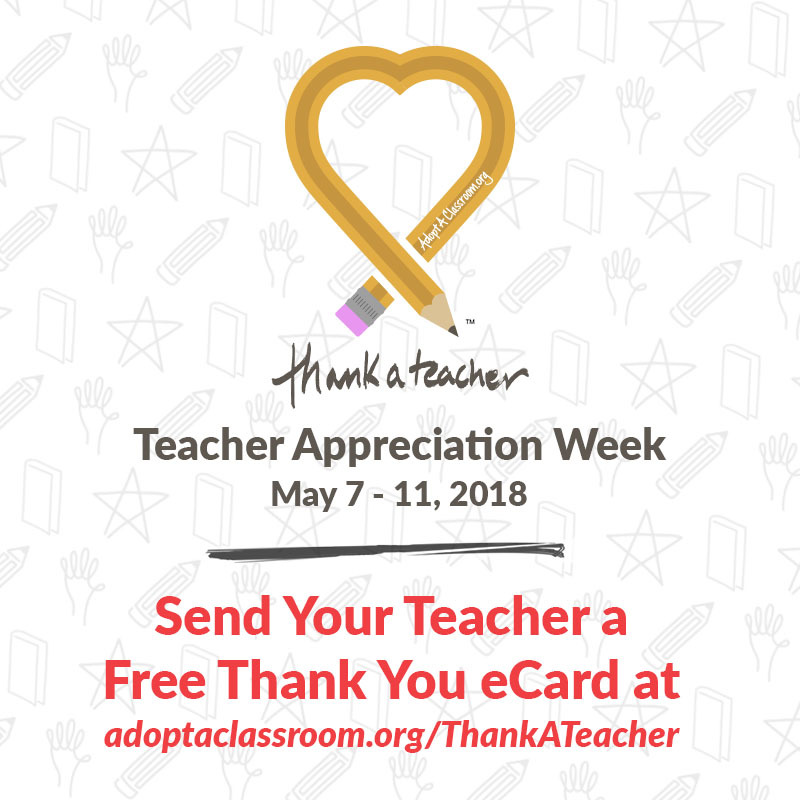 Take a minute now and AdoptAClassroom.org will automatically send your eCard on Tuesday, May 8, Teacher Appreciation Day. Thank you for helping us tell our teachers that they are valued.